Our Frida bolero is a versatile lace wrap top with a three-quarter sleeve, perfect as a cover-up for your wedding or evening dress, or as an elegant top to dress up any casual outfit. The top is made in a soft and elastic lace and can be worn in many different ways. Wear it as a high neck lace top with a deep back, or cross it in the front as a cute ballerina wrap top. Your chosen option requires 5/6 weeks for dressmaking. If you want to try on the dresses, come to meet us! Ask for a free appointment to visit us in our atelier in Barcelona and we will offer you personalized service and advice. This exclusive service will be reflected in a 15% increase in prices. Prices in our webshop are exclusive for online orders. Available in the colors ivory, golden, rose quartz and black lace. Choose between the standard size S/M (US 6-8/EU 36-38) and size L (US 10-12/EU 40-42). Or order it "made-to-measure" to have it made after your own personal measurements. If it´s a standard size/ready-to-ship item you are welcome to return it wthin 14 days of receivement. Please contact us at orders@mimetikbcn.com before returning the package. We recommend returns with private courier service. If you want to change your dress, please contact us at orders@mimetikbcn.om within 14 days of receivement, informing us about the exchange you want to make. We can unfortunately not accept refunds or exchanges for made-to-measure dresses or other custom made items. For any question regarding your order please contact us at orders@mimetikbcn.com. Payment must be made ​​by any of the means indicated in the corresponding general condition. Fraudulent use of credit card or denial of the order will allow Mimetikbcn.com to not process or deliver the order, without having to provide compensation for the damages caused. The buyer can cancel the contract within fourteen (14) working days from the date of receipt of the product by notifying our office via the following email: orders@mimetikbcn.com We will send you a report of return that should fill and attach to the returned product. This right may be exercised on one, several, or all of the items received. The exercise of this right depends on the fact that the articles on which it is exercised and its factory packaging materials (plastic shrink wrapping or seal) are intact and that such return is accompanied by supporting documents of the transaction or a copy. The buyer is responsible for the costs of return and for sending them properly protected for transport. Once the items are received and checked, Mimetikbcn.com we will proceed to reimburse the total amount paid by the customer at the time of placing the order, such refund will be made ​​by the same means of payment that were used to place the order. The right of termination or withdrawal regarding open, used or unsealed products cannot be exercised. If the item purchased through Mimetikbcn.com presented any damage at the time of purchase or impairment not related to misuse, accident, or negligent use of the product within 15 days of receipt, the buyer must notify our Customer service. We will proceed, if possible, to replace the item in the shortest possible time without additional cost to the buyer. Mimetikbcn.com is not required to compensate the User or third parties for the consequences of use of the product, such as direct or indirect damage, accidents to persons, damage to goods unrelated to the product or loss of profit. Mimetikbcn.com will show a description of each of the items offered through its Website, indicating at least use, materials, sizes and colors. The user will be responsible for any consequences of not taking into account the information provided by Mimetikbcn.com regarding these characteristics. For any complaints or information concerning the operation of the Website, billing, quality or any other matter relating to the Service, please contact our Customer Service as soon as possible from the moment when you are aware of the corresponding event. You can contact us via the following email: orders@mimetikbcn.com. The same methods of contact also apply to any communication or notification you want to let us know about the Service and its execution. 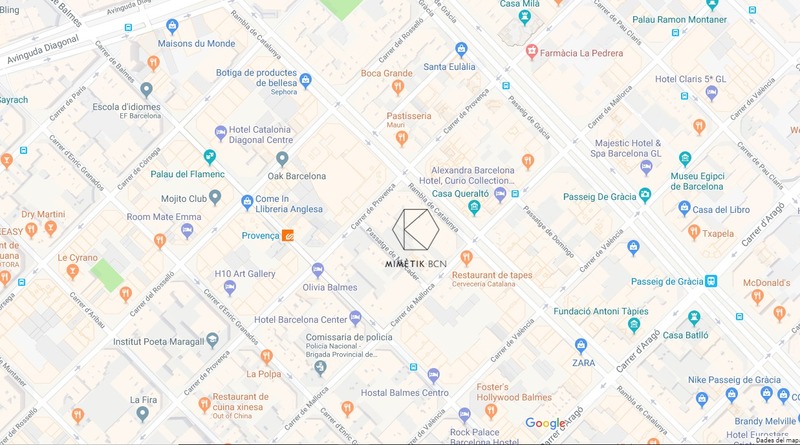 Once your claim is submitted, it will be assigned a reference number that Mimetikbcn.com will notify the User. If the claim is made ​​by telephone, the User may request a document certifying the presentation and content of it. This document shall be submitted within ten (10) days from your request. When the claim has been solved, Mimetikbcn.com will do everything in its power to inform the User about the solution adopted through the same means used to present the claim.